The first half of Fargo’s opening episode plays like a familiar tune in an off key. There’s a murder in the snow, a friendly, flawed man pushed to the absolute edge of his sanity and morals and a constantly building sense of something awful waiting for everyone, out in the blizzard. It’s beautifully shot, immaculately acted and feels off. Someone whose handwriting you know writing with their offhand, a film playing at slightly too high a speed. Because Marge Gunderson is missing. In the original movie, Marge, played in an Oscar-winning turn by Frances McDormand, is the sun everything orbits around. Seven months pregnant, relentlessly decent, cheerful and dogged in her pursuit of the criminals at the center of the case, Chief Gunderson is regularly voted one of the 100 Greatest Movie Characters Of All Time, an honour that as you see, deserve capital letters. Here, at first glance, Marge has been swapped out for a male character, Chief Vern Thurman. Vern, played very well by Shawn Doyle, is an expectant dad, a great cop and a stern but extremely fair boss. In any other show, he’d be a character you could hang the series off; a rural Gil Grissom, a gentler Leroy Gibbs. Here, for the first 45 minutes, he feels like a man taking a pregnant lady’s chair. 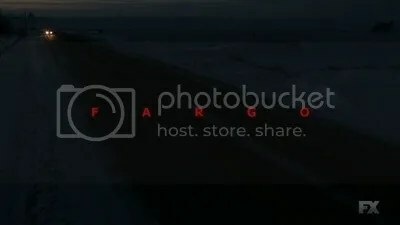 The idea of the all new, all masculine Fargo has even extended to the marketing, with Allison Tolman’s Molly Solverson barely registering against the male leads. It’s also led to plenty of people deciding to not bother with the show. No Marge, no deal. I watched the first episode last night and nearly bailed at the halfway point for the same reason. I didn’t and I’ll be back next week. Here’s why. The entire apparent lack of Marge is either a con or a misstep depending on how kind you’re feeling. It’s an extremely smart way to hold your audience’s attention and subvert their expectation. Seeing Thurman investigate the crime is like seeing Sherlock Holmes work a case in Gotham, all the elements are logical and fit but none of them quite fit together. That ferments a sense of tangible unease that closes the psychological circuit between you and the TV show. This is a series about people living in the moment just before, and just after, the blow lands and if they’re not comfortable you can be damn sure you won’t be either. As a result, when Thurman is killed you’re extremely conflicted; this is a good man, an expectant father who was in the wrong place at the wrong time, in every sense. But part of you is relieved. Like Malvo says at one point in the episode, we’ve been told there are rules. There aren’t. The fact this is a show that murders its lead in the closing scenes of episode 1, and makes you this conflicted about it, drives that home. It also neatly sets up Tolman, as Molly Solverson, to take the lead on the case. That in turn marks this out as something unique; a remake, a do over and a prequel all in one. Gunderson Begins or, in this case, Solverson Begins. Significantly, the final scene of the episode is Molly turning her back on safety and going to work. Chief Gunderson may not be on the case, but Officer Solverson is and that’s more than good enough for me. That first half is still hard work though and helping you get through it are Billy Bob Thornton and Martin Freeman. 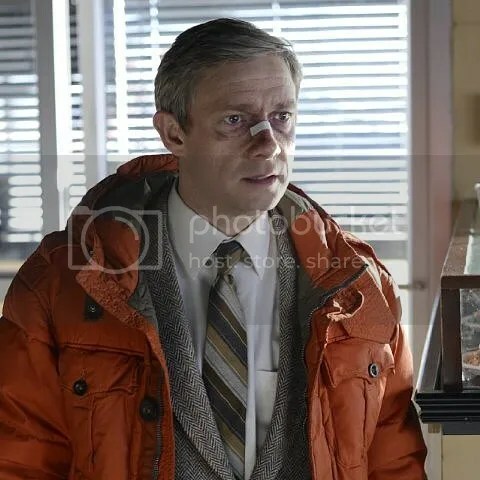 Freeman is the perfect casting for Lester Nygaard, the increasingly put upon, good natured, confidence free leading man. In fact, seeing Freeman go back to this sort of nervy, jumpy role throws his work in Sherlock into a different light. His John Watson is a controlled, focused, quietly immensely angry man who has learned to face that anger and make it both a weapon and a tool. His Lester Nygaard is a man defeated by a washing man, a window, his past and himself long before anyone else gets his hands on him. Freeman, and Lester, endure a barrage of the most awful verbal cruelty for those first 45 minutes. His old high school bully torments him in front of his children, Lester’s wife spitefully jokes about wishing she’d married his brother who, in turn, reveals he sometimes tells people Lester’s dead. He’s a man who exists only to be something other people refuse to be, and Freeman’s brittle, desperate good humor is the perfect foil for that. But, again, the back half of the episode shows us the truth. Lester kills his wife with a hammer and is absolutely grief stricken. Then, he walks over to her corpse and caves her skull in, landing blow after blow and muttering ‘Oh geez’ with every one of them. Then he calls Malvo, asks for help and rehearses what he’s going to say to the hitman before he kills him and frames him for his wife’s murder. This is the real Lester, not the victim who’s been knocked around his whole life but the survivor who’s stood back up every single time. He’s still a thousand miles from competent, but he’s got base animal cunning and that puts him far closer to Malvo than he’d like to admit. And that brings us to Lorne Malvo. Billy Bob Thornton’s take on the hitman at the centre of the case is a world away from Steve Buscemi’s nervy original. Lorne is a point of black against the snow, absolutely calm where Lester is absolutely not. The first time we meet both men tells you everything you need to know about them; Lester has his character assassinated a little more by his wife and all but makes a run for it. Lorne hits a deer, crashes his car, sees his victim escape and puts the deer who hit him out of its misery before getting himself medical attention. One of these men is a victim. The other creates them. That seems at least for now to be the basis of his character. This is a man who has absolute freedom, knows others do not and uses that freedom to move through the world with purpose and a distinctly blood-stained serenity. His concern for Lester is the one thing that seems out of place, and the revelation that Lorne is part of a network (possibly of hitmen?) and is taking a couple of personal days in town suggests he may have a long term plan for the hapless life insurance salesman. It may also provide the basis for the single most chilling scene in an episode featuring an icepick stabbing, shotgun homicide and murder by hammer. Look at the way Colin Hanks as Grimly reacts when Lorne asks how old his kid is. That involuntary step back, hand on gun, is a threat response and an acknowledgement of who really has control in the situation. It’s also classic fight psychology on Lorne’s part; knock the other guy off his centre of balance and keep hitting him. In seconds we get the fact he knows his name, that he has a daughter and that he will die, right here, unless he lets Lorne drive away. All of it delivered in an even tone with almost no facial movement and all of it terrifying. This scene looks to be one of the axes the show will orbit around. Most obviously, it introduces Grimly and gives him a reason for getting involved that’s as complex as Lester’s, but comes from the other direction. Grimly is a good, successful man who, like Lester, has a talk with Malvo. Lester’s talk leads to murder and the loss of what’s left of his morals Grimly’s leads to him surviving at the expense of his principles. That’s clearly going to eat at him and looks like it’ll provide the equal parts Minnesota Nice/Cop banter that I suspect will power his work with Molly. But it also shows us just what sort of character Lorne is. Lorne has almost supernatural knowledge of people, both factually and psychologically. Whilst I don’t think that’s where they’re going with him, the question of how he knew Grimly had a daughter, or indeed his name is a fascinating one. The answer looks like it’s waiting in that room with the identical Bakelite telephones and the ‘Network’ we glimpsed earlier on. But for us, for now, it tells us just how free Lorne is. There are no rules he follows, moral, ethical or narrative. He’s a straight line cutting across the series and anyone who gets in his way and lives is either desperately lucky or someone Lorne has a plan for. And, let’s face it, Lester Nygaard isn’t a lucky man. Fargo is, for its first half, a familiar tune played in an off key. But as the episode closes you realize it’s not an off key, just a different, complimentary one. The same notes are here; troubled, doomed small town criminal, hitman, rural noir and good natured, gifted female police officer. What makes the series shine isn’t how it treats them but the foundation it sets them in, a vast blank canvas of snow and lies and petty rivalry that will be covered in blood by the time the series finishes. Whose hands that blood will be on remains to be seen.